SOARD Solutions, LLC was founded on the belief that drone technology will save lives and property during emergency situations. I still hold those truths to be self-evident. As the company grows and our flight hours accrue, so will the number of lessons learned. I have always been a proponent of “After Action Reviews”. I have come to realize that mistakes happen and will continue to do so. All we can do is prevent the same mistakes from happening again. The only way for us to grow as an organization is to accept them, learn, and keep moving forward. We were taught a tough lesson that will not soon be forgotten. 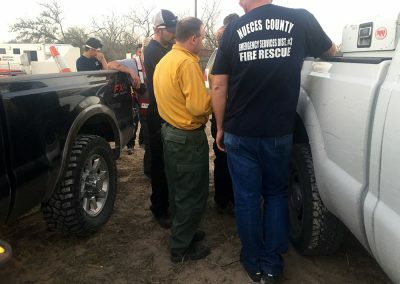 I encourage everyone who will be using drones in emergency situations to read this and hopefully learn from our mistakes and prevent the same from happening to you. On January 22, 2017, SOARD Solutions, LLC committed to volunteering its personnel and equipment in response to a wild land fire in Brooks County, Texas. Our response led to the destruction of one drone and the loss of another. In the larger scheme of things, the loss of two drones is nothing compared to the overall destruction caused by the fire. We are still ultimately thankful that thus far, there have been no reported injuries or homesteads lost due to this incident. An internal inquiry as to what caused the loss of these two aircraft was conducted and the findings are not only being recorded as per our procedures, but they are making their way into our Remote Pilot Courses so that we can prevent these accidents from happening to one of our students. As is the case with most instances such as these… They could have been avoided. Before we delve into what occurred, I would like to give you some background information on the fire. 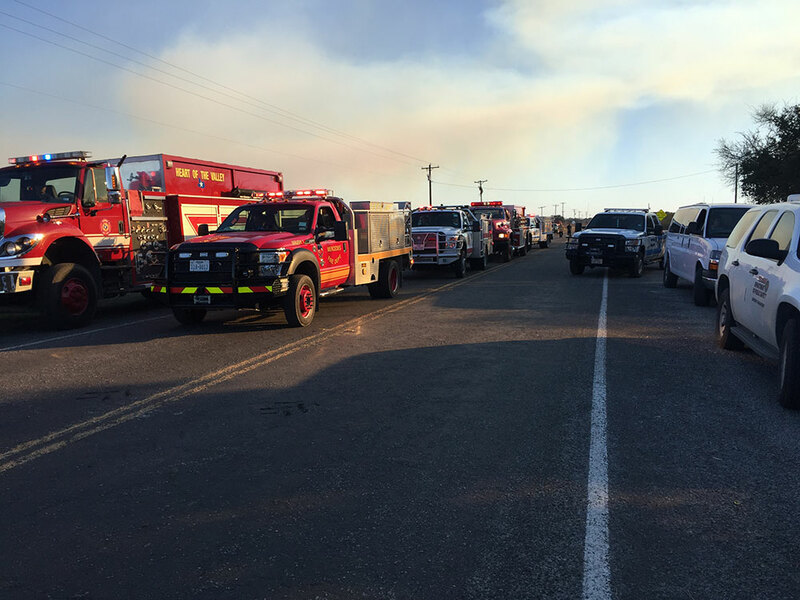 At the time of our arrival at the staging area, the fire had affected approximately 4,000 acres and was growing rapidly. Contact was made with the incident commander and we were apprised of the situation. 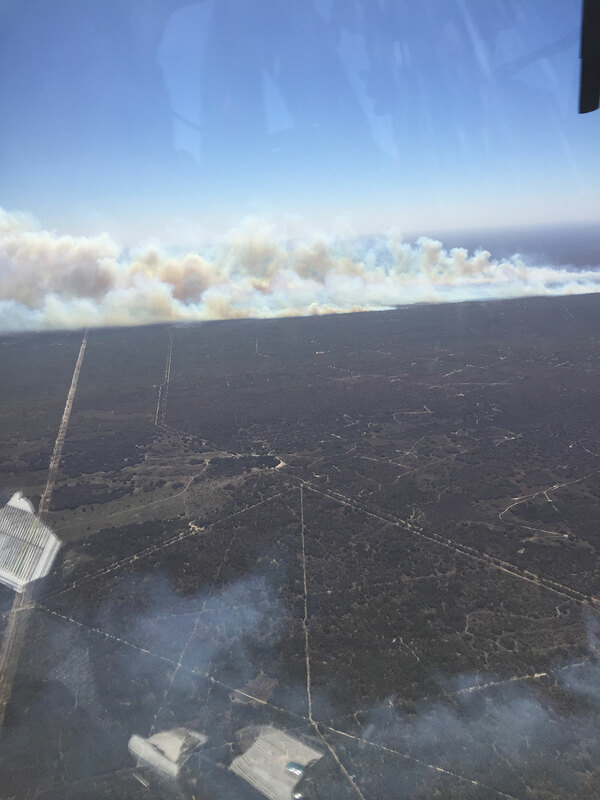 We were approximately 12 miles away from the fire and ground crews were having trouble gaining access to the thousands of acres that were in the destructive path. High winds had grounded most aircraft in the area including assets from Customs and Border Protection (CBP). These same winds were pushing the blaze towards a residential area in the small town of Encino, TX. Evacuations were underway. 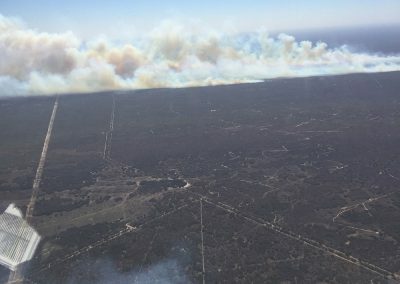 A SOARD airman was chosen to board a Texas Department of Public Safety (DPS) helicopter and assess the damage and any access points that may be available for ground crews. The plan was to utilize the helicopter as long as possible and then launch drone equipment with “bulldozer” crews that would be cutting firebreaks. SOARD was to provide over-watch for the slow-moving equipment. 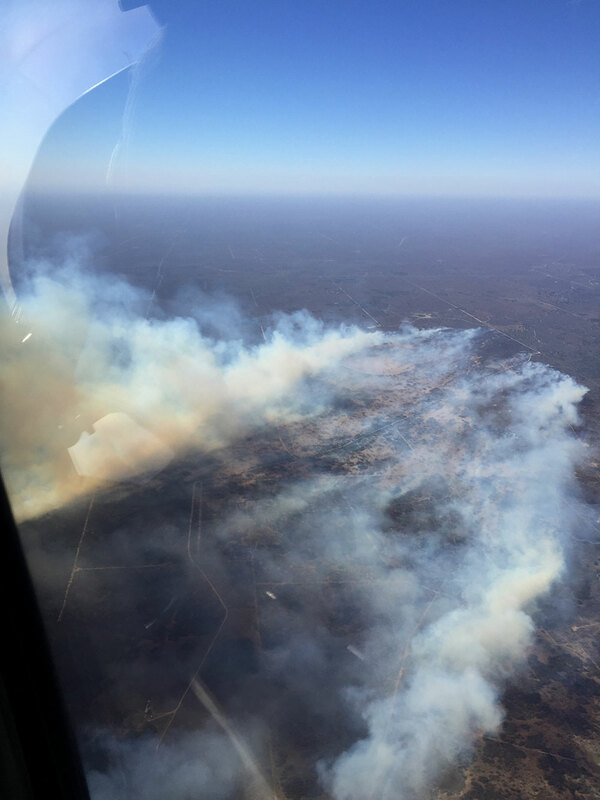 By having a drone in the air, incident commanders would be able to direct the equipment towards the most efficient routes as well as provide life safety by monitoring their distance from the fire. Should the fire advance at a speed that endangered the operator, a decision to evacuate the area could be made early enough to spare not only his life, but the machinery as well. Once the DPS Helicopter returned to base, SOARD took to the sky. The limiting factor (LIMFAC) would be the drones’ ability to maintain stable flight in the high winds. (Sustained winds of 25 and gusts of 36 MPH) and the heavy cover from tall oak trees that limited visual line of sight operation. We calculated the risks and decided that we could launch a DJI Phantom 4 in “sport mode” and maintain ground position if we corrected for gusts. During the flight, the Phantom 4 experienced varying angles of attack during gusts. Approximately 22 minutes after launch, it approached a designated landing zone that was in a small clearing between trees. It was to land for a routine battery swap. the ground effect from the wind finding its way through the trees caused the drone to rapidly change direction. The remote pilot differed to previous experience and let go of the joysticks in an attempt for the on-board GPS to take over and maintain position. Unfortunately, the GPS had been disabled due to the system being set to “sport mode”. The drone made contact with a large oak tree and was destroyed. While many factors led to this, there are some key areas that could have mitigated the risk. I understand that at times the situation necessitates flying in unfavorable conditions. During these situations, time is critical and we must force ourselves to follow procedures. I would advise pilots/agencies to have landing procedures in place that include a system check. This would have undoubtedly brought the lack of GPS stabilization to our attention and prevented the destruction of our equipment. Lesson: Implement policies and procedures that include unlikely circumstances, then follow them. Within 5 minutes of the crash, a flight team was performing preflight checks on a second drone. We made a quick notation regarding contributing factors with the first crash and vowed not to make the same mistake twice. The second system was a Phantom 3 Professional that would be documenting the scene in 4k as well as providing high resolution video down-link. Due to the lack of “sport-mode” on the Phantom 3, an area downwind (South East) was selected to serve as the drone operations area. Using ground effect and friction, the pilot could use vegetation as cover from wind gusts and quickly advance towards the fire. With a different landing zone secured, the Phantom 3 took off and was quickly racing towards an area where a ground crew was to begin cutting fire breaks. After several flights, it appeared we had caught a break. The winds suddenly subsided and the fire began to slow its rate of spread. Without the high winds, the Phantom 3 could move quickly and fly at a higher altitude. 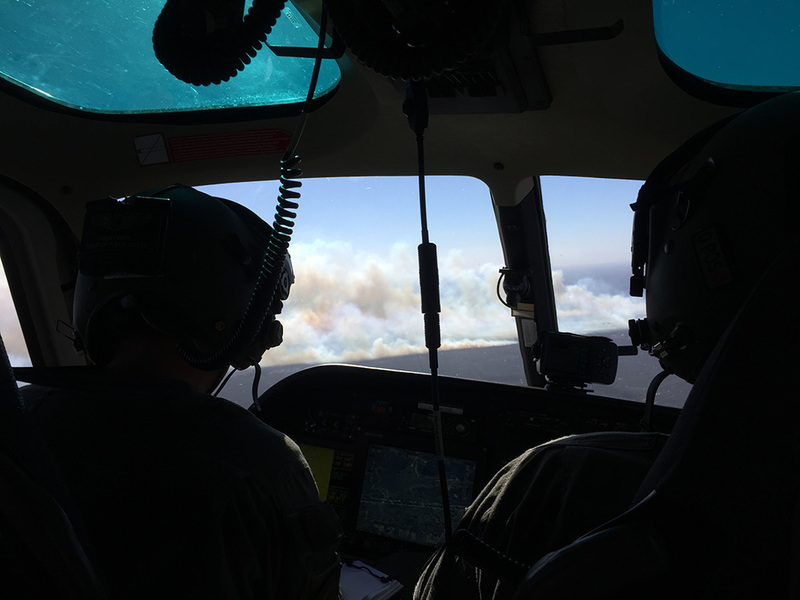 We began to operate at approximately 300 AGL and would drop down if we needed to focus on something specific or verify the presence of potential obstacles for the ground crews. Suddenly, the aircraft began to climb. Although it remained in Class G airspace, it climbed to over 5,000 AGL, then began racing south of our location until signal was lost. The last data transmission from the aircraft to controller showed the battery at 28% capacity. Even if we would have regained positive control of the system, we knew that there would not have been enough power to return home or to one of the three locations that were deemed safe for use as “emergency ditch” points. The obvious question is “what caused the radical deviation?”. The answer to that question is quickly working its way into the “weather” section of our first responder training. Wild-land fires pose a unique set of problems for aviation in general. Those problems are amplified for multi-rotor drones due to the light weight and lower altitude at which they operate. The most common problem is visibility due to smoke. Typically, S.O.A.R.D. flight crews will opt to set up downwind from the target area as to minimize the strain on the return leg of the flight. Doing so during a fire puts the aircraft in the path of the smoke. 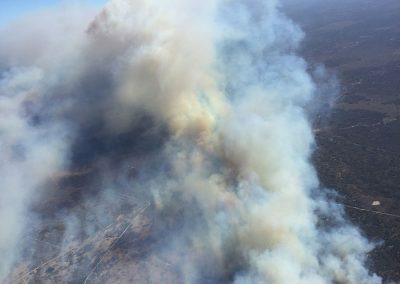 Most of wild-land fires are wind driven. The large weather systems that produce high winds are fairly easy to forecast. 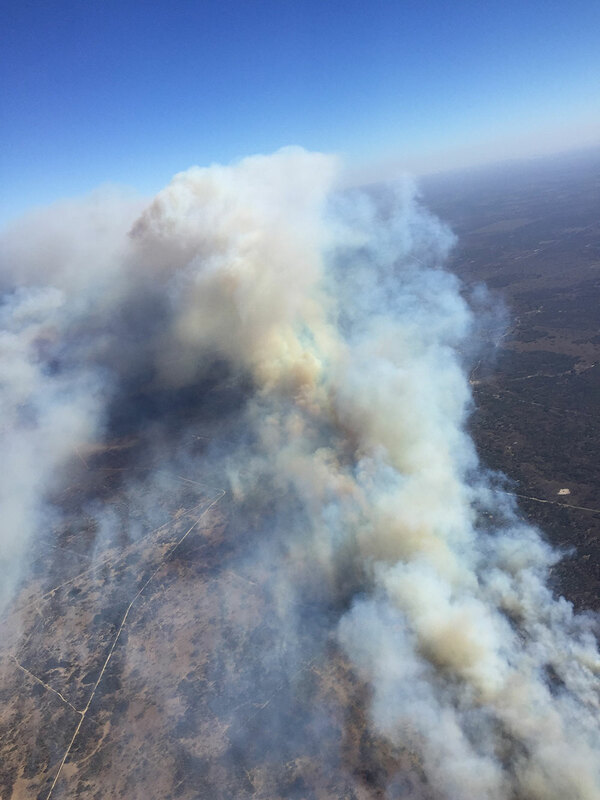 Although the wind forecast can predict the direction the fire will travel, fire control can still be difficult. In this case, the high winds and high volume of fuel caused the fire to spread at exceptional speeds. A high rate of spread coupled with high winds will usually mitigate upward drafts and dissipate the heat rather quickly. 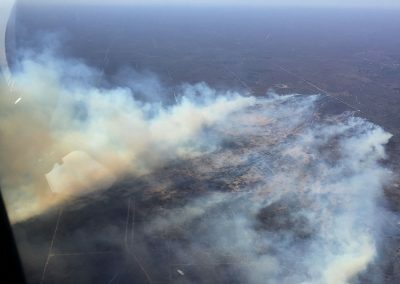 If the wind subsides while areas with heavy vegetation are still in the process of burning, the fire can develop a vertical component. Air, heated by the fire, becomes buoyant and rises, causing a “convective column” overhead. This can be amplified by the relative heat and humidity surrounding the upward thermal current. With a significant convective column, a wildfire can literally start producing its own weather. A low level in-flow of air will move towards the fire to replace the air that is being taken aloft. Causing convective currents that will “pull” an aircraft towards the base of the column, and then “push” it upward. Convective columns of this magnitude are similar to thunderstorms. They can produce updrafts and downdrafts that have the potential for devastating effects on manned aircraft as well as drones. Lesson: Understand the desired end state for the mission, and then use experience and training to identify potential problems and/or hazards that may prevent you from achieving it. The fire continued to burn for two more days. 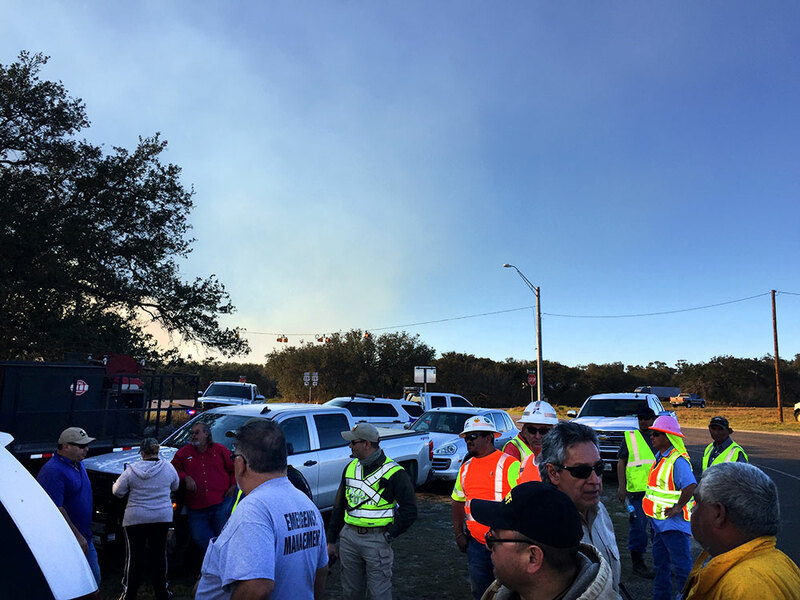 SOARD Solutions remained on scene and involved in fire containment efforts after the loss of the drones. Additional equipment was in place that could be launched at a moments notice should the need have arisen. 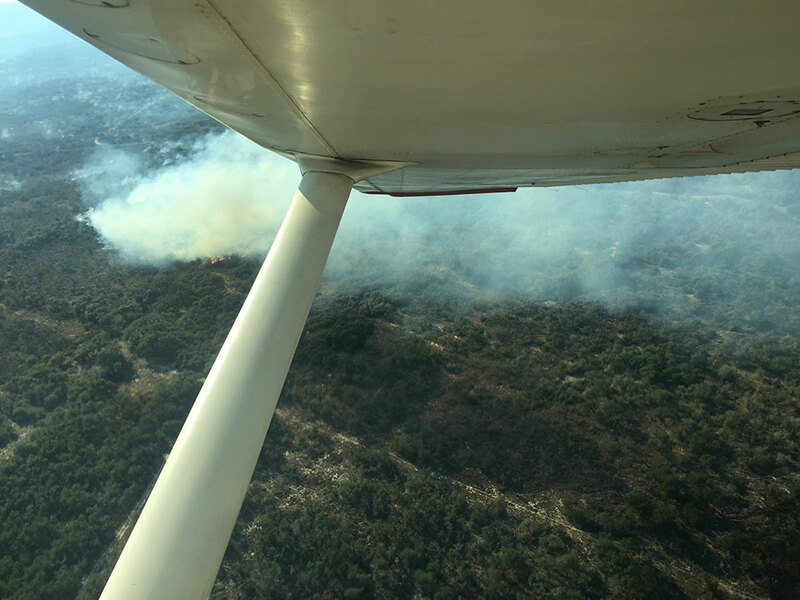 Not wanting to carelessly risk loosing additional drones, SOARD arranged for a Cessna 182 to assist with continued efforts of fire containment (at no cost to taxpayers). By Wednesday, the fire was contained. 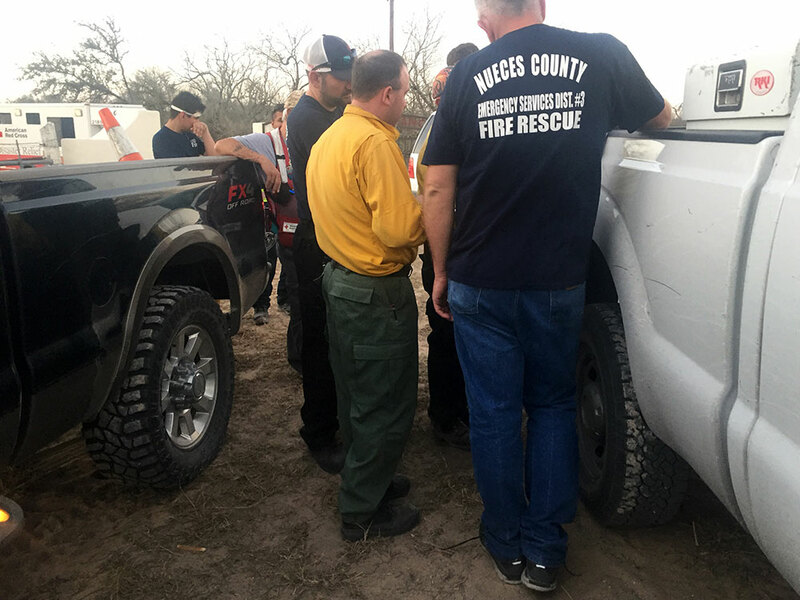 SOARD Solutions was credited with saving hundreds, if not thousands, of acres by providing real time information to the incident commander and his team. Lesson: Have a back-up plan. At SOARD, we believe in redundancy. We also know that situations don’t always unfold in the order than we would like them to. Make sure to have arrangements in place so that minor setbacks will not cost you a mission. We use PACE models when we begin our planning phases. Find a planning procedure that works best for your organization, and stick to it.